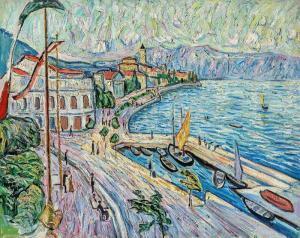 Find artworks, auction results, sale prices and pictures of Theo Von Brockhusen at auctions worldwide. Brockhusen, Theo von 1882 Marggrabowa - 1919 Berlin. «Gardone VII». Um 1913. Öl auf Leinwand. Unsign. Verso auf dem Keilrahmen auf einem Etikett handschriftlich bez. «Brockhusen», bet. und «B 134» num. sowie auf zwei Etiketten der Galerie Ferdinand Möller, Köln, bet. und bez. H. 81, B. 100,5 cm. Das Œuvre des preußischen Malers bewegt sich ambivalent zwischen Impressionismus und Expressionismus; seine intensive Farbigkeit schlägt sich vor allem in den Landschaftsausblicken nieder. Authentifizierung: Wir danken Frau Claudia Böckel, Regensburg, Verfasserin des Werkverzeichnisses von Theo von Brockhusen, für die wissenschaftliche Beratung via E-Mail, anhand von Photos, 03.08.2018. Frau Claudia Böckel wird das Gemälde in ihr in Vorbereitung befindliches Verzeichnis der Werke Brockhusens aufnehmen. «Brockhusen war 1913 Preisträger des Villa Romana Preises und verbrachte ein halbes Jahr mit seiner Frau zusammen in Florenz. Auf dem Weg dahin machten sie in Gardone am Gardasee Station. Der Blick scheint der Blick aus dem Hotelzimmer gewesen zu sein. [...] Die Galerie Ferdinand Möller vertrat Brockhusens Werk.» (Claudia Böckel, Regensburg, 03.08.2018). Provenienz: Privatsammlung Süddeutschland. Brockhusen, Theo von 1882 Marggrabowa - 1919 Berlin. «Gardone VII». Circa 1913. Oil on canvas. Unsigned. Verso on the stretcher a label, thereon handwritten inscribed «Brockhusen», titled and numbered «B 134» as well as two old labels of Gallery Ferdinand Möller, Cologne, thereon titled and inscribed. H 81, W 100,5 cm. The Oeuvre of the Prussian painter ranges ambivalently between Impressionism and Expressionism, making use of an intense colour which condenses especially in his landscape views. Authentication: We would like to thank Mrs Claudia Böckel, Regensburg, author of the catalogue raisonné of Theo von Brockhusen, for the scientific advice via E-Mail, based on photos, 03.08.2018. Mrs Claudia Böckel will include this painting in her forthcoming catalogue raisonné. «Brockhusen had won the Villa Romana Prize in 1913 and passed six months in Florence with his wife. On their way, they stopped in Gardone at Lake Garda. The view seems to be the view from his hotel room. [...] The Gallery Möller represented the work of Brockhusen». (Claudia Böckel, Regensburg, 03.08.2018). Provenance: private collection South Germany. 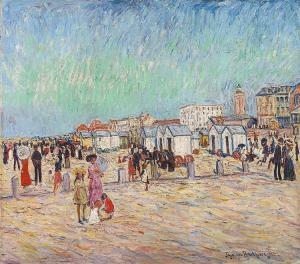 Theo von Brockhusen, Strand in Knocke IX, 1909 Signed and dated 'Theo von Brockhusen 09' in black lower right. - Printed label from Galerie Möller verso, therein type- and handwritten name of the artist and title "Strand in Knokke IX" and designated "Nr. C 772". A further label with the inscription of the name of the artist and the title "v. Brockhusen B 92 Strand in Knocke" in handwriting.Around 1908-1910 Theo von Brockhusen's work was defined by a light palette with which he cheerfully presented pictures of selected open-air settings - whether beer gardens or life at the beach. Like other Impressionists he searched for new motifs along the coast of the Netherlands; from 1906 to 1908, he spent his time in Knokke-Heist, which was then still a new seaside resort on the Belgian coast. It had only been a few years since Knokke had developed into an ocean resort when it became possible to hire bathing machines in Heist; with its Art Nouveau villas, Knokke now provided a suitable ambience for its sun-hungry guests. 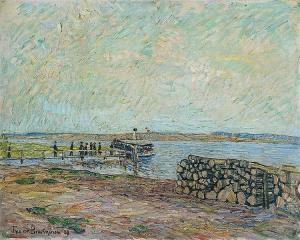 The artist created broad prospects of empty shores along the edge of the sea, but also depictions of mondaine life at the beaches. From a low vantage point, we look up over a group of playing children, ladies wearing long dresses and cartwheel hats and gentlemen in black suits at the impressive architecture built along the beach's promenade as well as the Jugendstil lighthouse. The scenery has been affectionately recorded in rich detail and reproduces the atmosphere of a cloudless summer day. 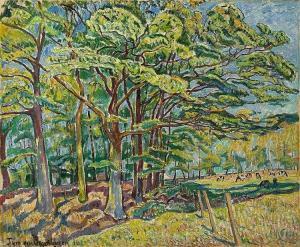 From 1919, following Theo von Brockhusen's suicide, Ferdinand Möller managed his artistic estate at the painter's request and saw to it that his Impressionist oeuvre became more widely known by means of numerous exhibitions. According to the label on its reverse side, the painting offered for sale here also came from one of these. Theo von Brockhusen, Dampferbrücke an der Havel, Signed and dated lower left: Theo von Brockhusen 08. On the upper stretcher bar an old label, inscribed in pen and brown ink: v. Brockhusen [No.] 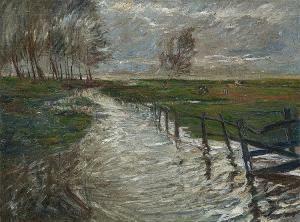 B 44 Dampferbrücke an der Havel, Oil on canvas, 1908, 25 3/8 x 31 3/4 in. Signed 'Theo von Brockhusen' in brown lower left as well as inscribed "Luchlandschaft, Wustrov - Langen" verso on the stretcher. We would like to thank Claudia Böckel, Regensburg, for the kind additional information. Luch is an area with swamps and meadows in the northeast German Havelland. With few professional retouches. Verso with a few rubbings. 37 3/4 x 45 7/8 in.